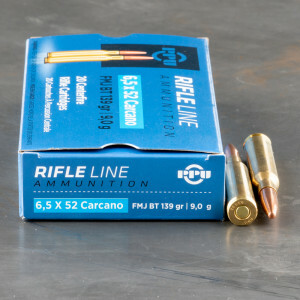 6.5 Carcano ammo, also known as 6.5x52mm Italian (aka 6.5mm Italian, 6.5mm Italian-Carcano, 6.5mm Mannlicher-Carcano) is a centerfire, rimless, bottle-necked, .268 caliber, rifle cartridge developed by the chief technician Salvatore Carcano at the Turin Army Arsenal in Italy. The cartridge was adopted by the Italian Army as the official service cartridge in 1890 for use in the Mannlicher-Carcano model 1891 bolt action rifle. 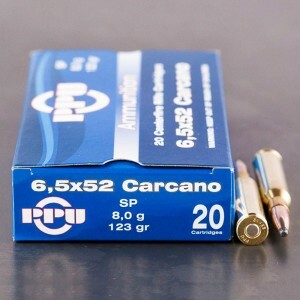 Consequently, this cartridge is often mistakenly referred to as the "6.5mm Carcano" but, the term "Carcano" actually designates an entire series of rifles designed by Salvatore Carcano; not exclusively the 6.5 x 53mm Italian cartridge. The 6.5 Carcano cartridge was relatively unknown in the U.S. until the end of WWII when military surplus dealers imported large numbers of Italian Model '91 bolt action rifles for sale to civilian shooters. Consequently, the use of this cartridge is now fairly widespread. Both factory loaded and military surplus ammunition is usually readily available for sale in bulk and smaller round count quantities. 6.5 Carcano ammunition is very similar in appearance to the Mannlicher-Schoenauer in size, shape, and performance, the military round fires 162 grain, round nosed, full metal, jacketed bullet at muzzle velocity of 2,296 feet per second, for a muzzle energy of 1,902 foot pounds. Also, when loaded with soft point spitzer bullets instead of the military, round-nosed, full metal jacket bullet (FMJ), this cartridge makes an excellent round for hunting small to medium sized North American game species up to and including Whitetail Deer, Mule Deer, Antelope, and Black Bear. Shot really well. Rare caliber at a great price.